Living in Cape Point means being surrounded by nature. Some people embrace this, and some fight it (though why they would move into an area such as this and then complain that there are things living amonst them amazes me.) The layout of the area means that quite a lot of people have boundary fences that border onto fybos areas. This may mean that you have fantastic views off the back porch, but it also means that you have to live with everything that shares the space. This is what faced regular site visitor Mary Koster the other morning. Their property borders the Silvermine Wetlands and one of the locals had decided to check out her back garden as a suitable place to spend the winter. The meter long Puff Adder was by all accounts a magnificent specimen, but it is not exactly something that you want hiding in the garden. No need to panic and reach for the spade, just relax, keep an eye on where the snake is, keep your distance and call someone (more on this later). Many people are very scared of snakes, however, this is mainly due to misunderstanding and ignorance, which we overcome through knowledge and understanding. The Cape Point Peninsula has three species of snake that can be considered dangerous to humans; the Cape Cobra, Puff Adder and the Rinkhals (though now considered so rare that it is thought to no longer be found in the area.) Another snake is found in the area that is highly venomous, the Boomslang, however, it is an older evolution of snake that administers venom from its back fangs (this type of snake is commonly know as a back fang snake for this reason). The Boomslang hides in trees and ambushes it’s prey, and ‘chews’ on its victims, slowly working poison in. It relies on its ability to hide in trees rather than biting to protect itself and is a very relaxed snake so you would have to work very hard to be bitten in a way that would prove fatal. The Cape Cobra and Rinkhals are another matter. They are front fanged snakes and use hypodermic like fangs to inject venom into their prey. Venom is a very complex fluid and it cost the snake a lot of energy and resource to produce. For this reason they don’t like to waste it, many people who are bitten snakes don’t have any effects because the snake is only giving a warning to back off, for which it doesn’t want to waste precious venom, which it needs for catching prey. This is called a dry bite. This is apparently common with Cobras, though I wouldn’t personally want to test out the theory. Both these snakes are showy creatures, when threatened they let you know they are there and in a spectacular way by raising off the ground and opening their hoods. If you are confronted by this then simply back away, and at the first opportunity the snake will scarper (they are far more afraid of being chopped in half by a spade than you should be about being bitten.) Usually these two species are long gone before ever you get to see them as their natural tendency is to slide away as soon as they detect your presence, which is why it is a good idea to stomp around the mountains as the snakes pick up vibrations through the ground. One way to deal with one of these in your garden is to give it a route of escape and let it go, although you may expect it to return so it is wise to be on guard and alert your neighbours. 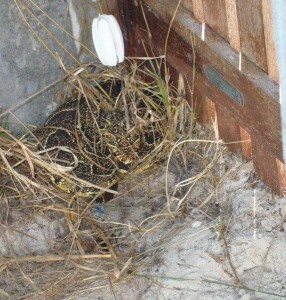 The best thing is if the snake can be safely removed and released away from habitation. Cobras and Rinkhals tend to be coloured from sandy brown to almost black, are long and slender and have the distinctive hoods. They tend to be all one colour. This snake was a meter long, as you can see it is very hard to define its outline, even with such a clear space around it. 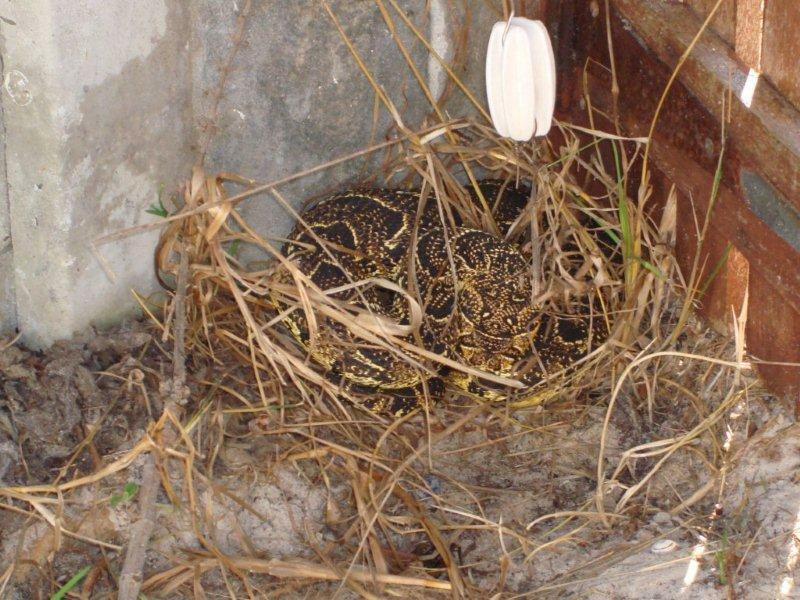 Puff Adders are different than the Cobra and the Rinkhals in that they really on camouflage to hide from you. So confident are they that their pattern makes them invisible that they will hide to the point that you tread on one, at which time it will bite you. Puff Adders are said to have the fastest strike of any snake in the world, though the rest of the time they are very sedate. There venom is highly toxic to humans and if left untreated could lead to death (probably yours and theirs). When frightened the snakes will coil up and puff themselves out to look as big as possible. 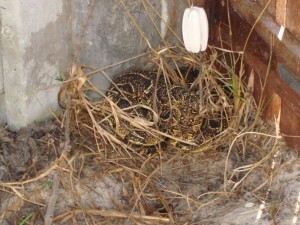 The danger with Puff Adders is that they may well be seeing you, but you may not be seeing them. The good thing about them is that once you have seen them, as long as they keep seeing a threat they won’t move, making it very easy for an expert to remove them. Puff Adders have a chevron pattern in their scales and tend to be predominantly olive green and brown in colour. Adults are typically a meter in length and very thick in girth. I cannot emphasize this enough- DO NOT TRY TO PICK UP A SNAKE YOURSELF- there are numerous experts on Discovery who make it look very easy to do, but it isn’t, and they all seem to get bitten at least once a series. You may try and coax it into a large cardboard box, but chances are that you are going to annoy the snake in the process. Why put yourself at risk. In this instance Mary phoned the police, who were there promptly and arranged for the snake to be taken away. I did a search on the internet and found several local snake experts who offer a removals service, though I am not going to publish their details here as I know nothing about them, so don’t want to recommend any of them. (If anyone who is reading this is a genuine snake remover then please contact me and I will publish your details.) You may also consider contacting the SPCA who will either come and remove your problem animal or will put you in touch with someone who can. One thing you should not do is leave the snake alone. It may go on its own, but chances are it entered your property with a purpose in mind, at this time of year it is probably looking for somewhere to spend the winter. Right now you know where it is, next time you may find its location by it hanging onto your finger. For this reason it needs to be removed and released somewhere well away from habitation. What ever the situation you should never kill the snake. If it is attacking you it is because you are antagonizing it. This is not Snakes On A Plane, the snake does not have murderous intent. Apart from the fact that snakes are a vital part of the local ecosystem, without whom we would have a pest problem of epic proportions, it is an offence to kill any wild animal. Other less harmful snakes that you may find in the garden are mole snakes, which are constrictors. They are dark in colour, tend to be long and thin and grow up to about a meter and a half in length. Hallo Lindie, jammer my Africaans is nie baie goed nie. Jy moet die dienste van ‘n slang hanteerder en ek wens jou geluk met daardie omdat die inligting is nie maklik te vind. Hulle is baie plaaslike operateurs en gewoonlik slang telers wat dit doen as ‘n kant lyn. Ek weet nie die Bloemfontein-omgewing op alle-miskien jou plaaslike raad kantore jy kan help, of jou plaaslike SPCA. Hello Lindie, sorry my Africaans is not very good. You need the services of a snake handler and I wish you luck with that because information is not easy to find. They are very local operators and usually snake breeders who do it as a side line. I do not know the Bloemfontein area at all- maybe your local council offices can help you, or your local SPCA. This is a great write up. I like that way that you have captured the essence of a snakes “aggressive behaviour”. As you mentioned, a snake will only ever attack somebody in self-defense. If you or your readers are interested I remove and am permitted by CapeNature to relocate snakes and am in contact with other catchers in Cape Town. Details of this service and other articles on our snakes, including the legislation behind killing them can be found on my website http://www.capesnakeconservation.com. One thing I’d like to point out is that the Western Cape rinkhals are actually quite boldly banded in yellow/orange on top, are black below and usually have distinct white bars on their neck/ throat region. Hi we recently find a cape cobra,but we managed to call the Firebrigate people to catch it.our fear is tht can it be possible that there are others around because our erria is sorrounded by bushes and we have children here. Where there is one snake you may easily find more. Look at if there is anything that might have attracted the snake into your garden- which will be mainly food sources, or places to get hidden away. Do you have rats, mice or anything like that on your property? If you live in an area where the is an increased likelihood of coming into contact with snakes then it is imperative that you educate your children in what to do if they come across a snake and, though it is unlikely to happen, have some kind of emergency plan should the worst happen. To be honest, you will likely never see another one, they are very elusive and shy. I live in Glencairn on the mountainside. 3 weeks ago there was a puff ader in my yard. It was the most scary thing and also this summer 2 cobra. Imhave become neurotic as do need them removed? Especially the puff ader. I have 2 small dogs and a cat. Imalsomrun self catering accommodation and am very afraid that they will breed and next summer be overrun. When imsaw the puff ader I called the snake man but he was gone and the snake man said he cannot do anything. But he is not gone, imknow this. Imhave frogs and a pool and lots of gheccos. Could you advise.